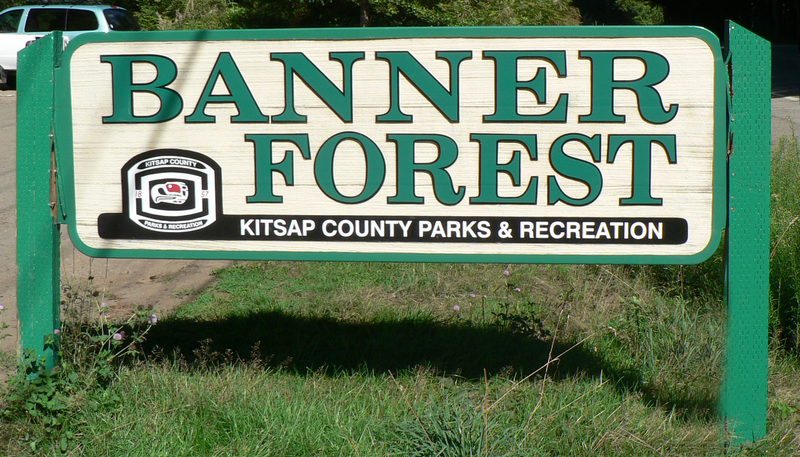 We haven’t trained at Banner Forest much, believing it to be “too busy” with mountain bikers and joggers. Today was an awesome, if short workout. Heather ran a certifying length trail through the woods, and Sally did a great air scent problem. We cut it short because of the heat, but it was still a very productive training day. The real joy was meeting all the joggers, walkers and mountain bikers. We ended up talking to many of them, and they were supportive of sharing the forest with us. Many seemed to know instinctively that with so many users, eventually somebody will get lost. They welcomed us with open arms, and one even asked about how he could join our K9 SAR program. You plan for good days, but you never really know what will happen that makes it a good day. Trident K9 Warriors is the tale of how K9s came to be used by US Navy Seals in some of the most demanding environments on earth. The book is well written with an interesting mix of entertaining war stories and educational information about K9s. Interesting that a lot of what warrior K9s do translates to the civilian search and rescue world. Scent theory is scent theory, I guess. There’s also good information on “operant conditioning,” which is a fancy phrase for “praise your dog for doing the right thing, instead of punishing it for the wrong thing.” Actually, dogs and people would benefit from a little more of that. Thanks to the author for his service to our country and for a really nice book. Most people and organizations try to keep their dirty laundry under wraps. Nobody needs to know those little secrets or mis-steps that haunt the past. But if you live in a home with someone who’s at risk of wandering, dirty laundry could save your loved one’s life. K9 Ruger taking a quick sniff of the family laundry hamper. One of the little challenges when we’re called to a search is getting a scent article for the missing person. If we’re in the woods, no problem, we don’t really need one. The dogs will find anybody who’s out there. But when someone with dementia or mental health challenges wanders off in a populated area, we need a scent article so the dog can pick them out from the masses. It can be very difficult getting an item of clothing that only the missing person has touched. Dirty laundry is the perfect scent article, with one big exception. Here’s the scenario: little brother goes missing, so big brother is first told to check around the neighborhood and find him. When big brother has no luck, the police are called and SAR teams get dispatched. But big brother has now also laid a scent trail around the area. If the two boys have been sharing a laundry hamper, there’s enough transfer of odor that we’re as likely to follow big brother’s scent as the one we want. 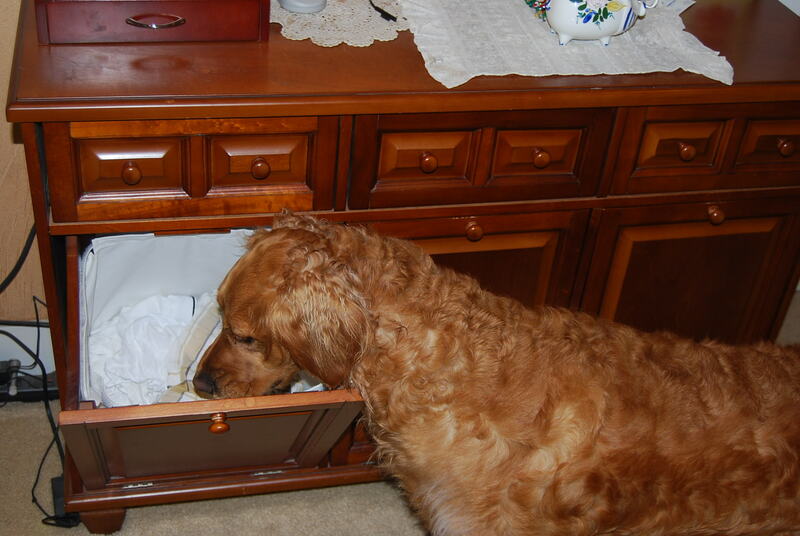 Let me say that again: the K9 nose is so darned good that if two people have shared a laundry hamper enough of each one’s scent will transfer between items that anything from the hamper is useless as a scent article. If you have someone in your home who is at risk of wandering, they need their own laundry hamper. If they’re capable, encourage them to place their clothing in the hamper themselves so no one else even touches it until laundry day. If your loved one goes missing, we dog handlers prefer to come in and collect the scent article ourselves. We don’t care how messy your house is…..I mean…..we have dogs. You oughta see our houses. We just want to do the best job we can of finding your loved one. Let me share with you the embarrassing little secret that search dog handlers don’t want you to know: sometimes WE get lost too. Sierra and Magnum have both led me back to my truck after searches. Magnum on a real search, in risky terrain. The good news is we have our dogs with us, and they love riding in our trucks. The jingling sound of the truck keys means they’re going to play in the woods. As a trainee handler, Sierra had led me to my pretend “lost” subject, no problem. But I’d been so intent on following her that I had no idea where we were. To compound things, the tree cover was so heavy my GPS wasn’t picking up a signal. So I turned to Sierra. “Let’s go back to the truck,” and off she went. Pretty soon I was recognizing fallen trees and small meadows that we’d crossed on the way in. I eventually broke free of the brush, to see her waiting patiently at the back of the truck. Later, Magnum would do the same thing in riskier terrain. There was a large swamp between us and the truck. It was the middle of the night, pitch black, and we’d come in through brush so thick I needed both hands to push through. There was no holding map, compass or GPS in my hands while I moved. Wearing a 40 pound pack, I didn’t want to step off into deep water. Magnum led me around the swamp, exactly the way we’d come in. So that’s the dirty laundry no dog handler wants you to know. What’s the one thing we WANT you to know? Oddly enough, that’s dirty laundry also. In an upcoming post, we’ll chat about your laundry hamper. If you’re a dog, this constitutes legal tender in all US states, territories and possessions. We all need a paycheck, either financial or emotional. Dogs are no different. If we’re going ask them to spend four hours on an 80 degree day slogging through sticker bushes there’d better be a paycheck when they find the missing person. Sierra’s paycheck was a simple orange tennis ball. She was completely psychotic for the toy, and only got it when she’d led me to a missing or hidden (training) subject. Once in her mouth, she refused to give it back. As sweet as Sierra was, I would loved to have seen a tax attorney or IRS agent try to get 28% of that particular paycheck. They’d have lost 28% of their fingers, I’m sure. Ruger on the other hand prefers a squeaky rubber Kong stick. Check the look on his face in the picture below. He looks like he just won the K9 lottery. Regardless of the toy involved, it’s presented with effusive praise from both the handler and the subject. Effusive is an old Indian word for “if you don’t feel stupid, you’re not doing it right.” Handler and subject speak in falsetto voices and tell Fido they’re “thebestdoginthewholeworldyestheyare! !” With a new dog, you might search for two minutes and play for five. It is amazing what our canine friends will do for a squeaky toy and a belly rub. They find more than people, too. They’re all supposed to find articles that might have been discarded by a missing subject. We call those “clues.” But did you know they can find a truck? Well, at least they can find MY truck. Sierra the Search Dog after a dip in the lake. In most other human/canine endeavors, the human gives the orders and the canine follows. Sit, heel, stay, go ramp, tunnel, jump are all commands given to dogs, and they execute them beautifully. I love watching a well-practiced obedience or agility team. But it’s one-way communication. The human is giving the orders. 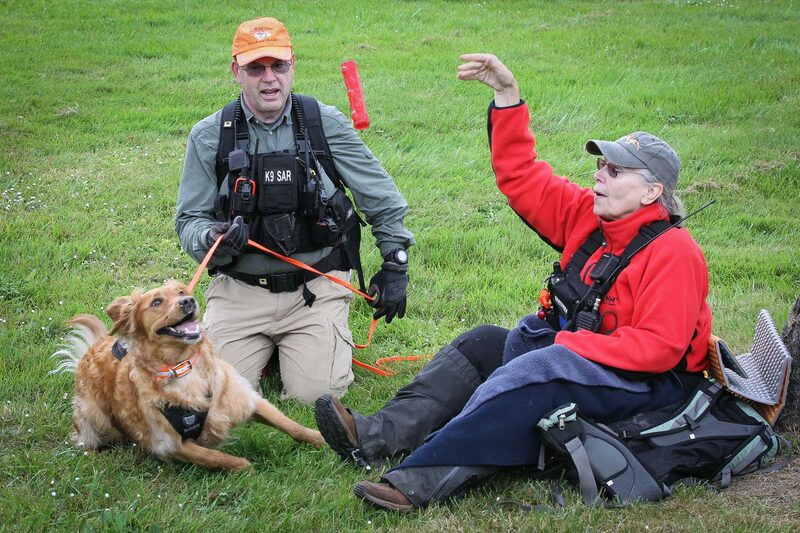 In search and rescue, the dog is in charge and it’s the handler who takes orders. The handler needs to learn when the dog is just roaming, and when their body language says “um….let’s go this way.” They haven’t found the person yet, but they smell something and want to check it out. Just as some humans speak in a soft voice, a dog’s body language can be very subtle. Handlers must learn that language and there ain’t no Rosetta Stone software to help. Being successful in search and rescue also requires giving up the illusion that we’re smarter than our dogs. They chase cars, chew furniture and hump the leg of a visiting nun. All stupid stuff in our minds. But the woods are the dogs’ domain, and they’re much smarter than us about how to do business there. Honest handlers refer to themselves as the dog’s “ball and chain.” If a search problem goes south, it’s almost invariably because the human thought they knew more than the dog. The dog’s body language was screaming “over here, over HERE!” The human wasn’t listening, and let their superior intellect lead them in the wrong direction. If you’re smart enough to follow the dog and make the find, it’s time to give the dog their paycheck. The best part of paying your dog is that the IRS can’t touch one red cent of it. 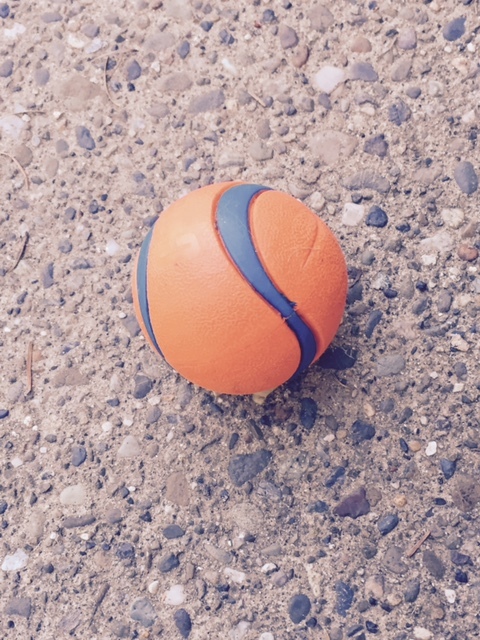 In my next post…..tennis balls and tax attorneys. Many years ago there was an awesome search dog named Sierra. She used her nose to help find missing people. Harness on and ready to go find somebody! 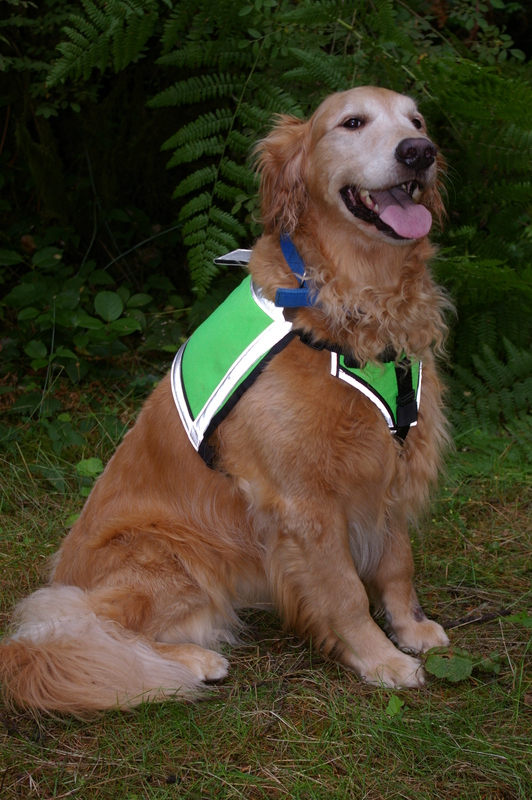 Sierra the Search Dog will soon return to life in a series of books for children and young readers. We’ll start out with stories that parents and grandparents will enjoy reading over and over (and over and over and over) to the youngest members of their families. As the children learn to read for themselves, they’ll be able to enjoy age-appropriate tales of Sierra’s exploits into their teenage years. These books are mostly intended as entertaining fiction. However, rest assured the characters will model ethical behavior and have positive messages for young minds. We might explore why someone would go missing, but always in the context of learning from that mistake. Thanks to Sierra, the stories will always have happy endings. For grownups, we’ll be writing some mystery fiction based on Sierra’s younger brother Magnum, who at age nine is still a working SAR dog. Those might be a little darker but should be equally entertaining to read. 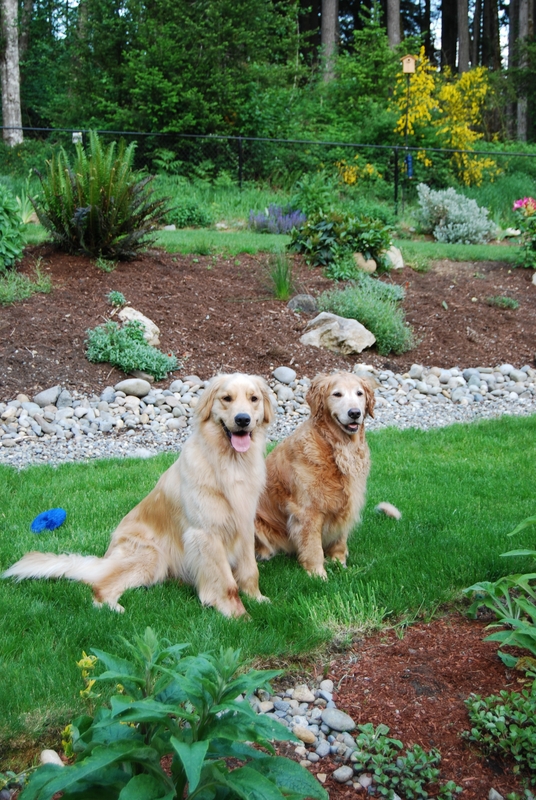 This blog is about the dogs, not about me. But a couple friends have asked that I write about the experience of becoming a first-time author. I’m putting together a great team of advisors to help me work the business side of creative writing. I can tell a decent story, but the book publishing world is new to me. Hopefully this blog will include mostly great stories about search dogs, but maybe a little bit about the publishing world. I might even take time to explain why thoughtful dog handlers refer to themselves as the dog’s “ball and chain.” Stay tuned!